Have you heard about podcasts, but you aren’t quite sure how to access them? I’m here to share some screenshot tips on how to follow a podcast, because it’s not extremely intuitive. I started the Beyond Good Intentions parenting podcast, and I’d love you to listen! 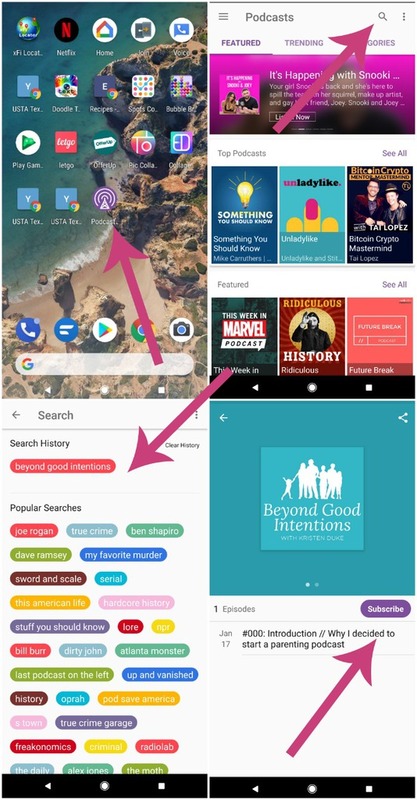 I still fumble from time to time finding and following and leaving podcast reviews, so first I’ll share how to follow a podcast on an iphone, and then on an android…sound good? The podcast app comes automatically with iphones, though some may have deleted it. It is purple and simply titled, “podcasts.” I’ll share the steps in text form, then screenshots below. WRITE A REVIEW on what you thought, what you think others would like about that podcast (REALLY helps with searches on Google, etc.) Or just leave 5 stars. Here is what the first page of my phone looks like…don’t look at those RED numbers! 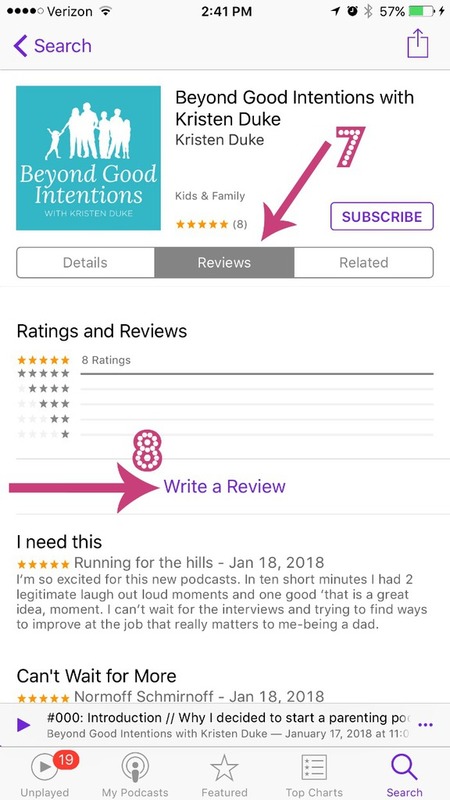 Podcasts THRIVE on Reviews! If you love one, take the time to leave a review, it helps them SO much. Even as simple as leaving 5 stars is helpful. Before I officially launched my podcast, my dad and brother were my first two reviews…LOVE them! Now that you have followed your favorite podcasts, all you have left to do is listen and enjoy! If you’re a parent, you might enjoy my parenting podcast, Beyond Good Intentions, about strengthening families.